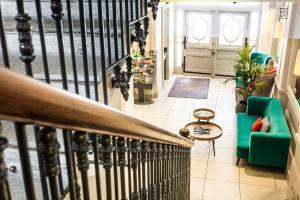 The location was excellent- staff was helpful and kind- very clean and comfortable room as well. comfortable bed. comfortable room. quiet location off the main street and friendly staff. 24 hour concierge. lots of great food and beverage options in close proximity to an outstanding Metro network. The lady at the reception was very friendly and helpful. Good hotel. Recommend it. Great location near the old town. Comfortable rooms with AC, nice tub shower. Little kitchenette is a plus. Every thing, location, design, staff. Will come back to it. Great location. Terrace was comfy and we used it a lot to chill out. Staff were very helpful. Bed was comfortable. Location is perfect. Close to everything in Annecy. 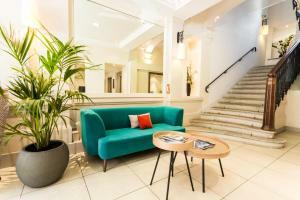 The staff were so nice and helpful, beds super comfy and nice to have a kitchenette. Will stay here again for sure. very good location, comfortable and quiet place in the center of the city. 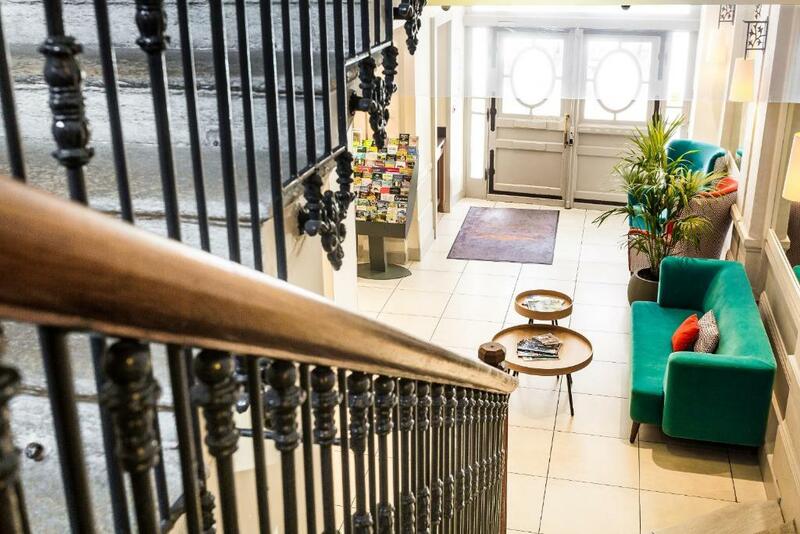 Lock in a great price for Privilodges Le Royal - Apparthotel – rated 8.3 by recent guests! 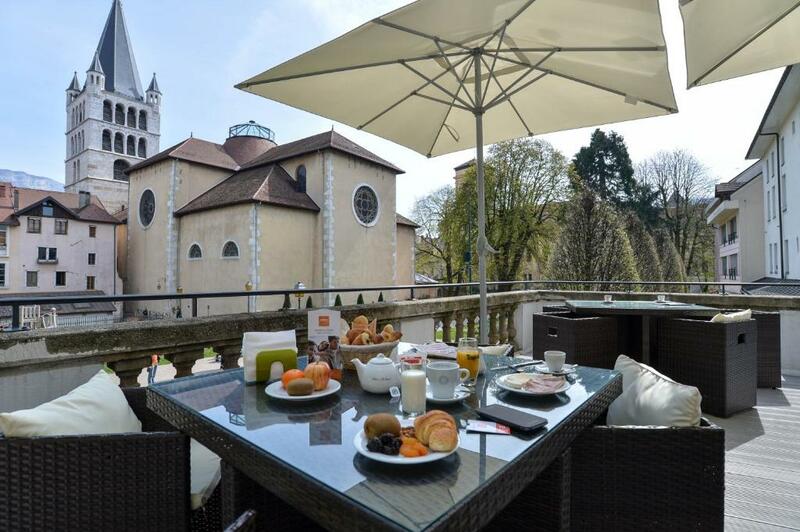 Privilodges Le Royal - Apparthotel is located 650 feet from Annecy Lake and 1,150 feet from the Palais de l’Isle Jail in the heart of the old town. It offers self-catering accommodations with free WiFi. The air-conditioned studios and apartments at Privilodges Le Royal feature neutral decor. A flat-screen TV with satellite channels and a seating area are provided in each. Bed linen, towels and daily cleaning are included in the price. The kitchenettes are fully equipped with a fridge/freezer, hot-plates and a microwave oven. A vacuum cleaner, iron and iron board are available upon request. At an additional cost, breakfast can be served in the breakfast room or outside on the terrace overlooking the park and the church. Guests at Privilodges Le Royal Apparthotel also have access to a fitness room and luggage storage. Annecy TGV Train Station is 2,150 feet from the hotel. Chateau d’Annecy is 1,950 feet away through the Old Town. A limited number of private parking spaces are available for an extra charge, upon reservation. Paying public parking is available nearby. 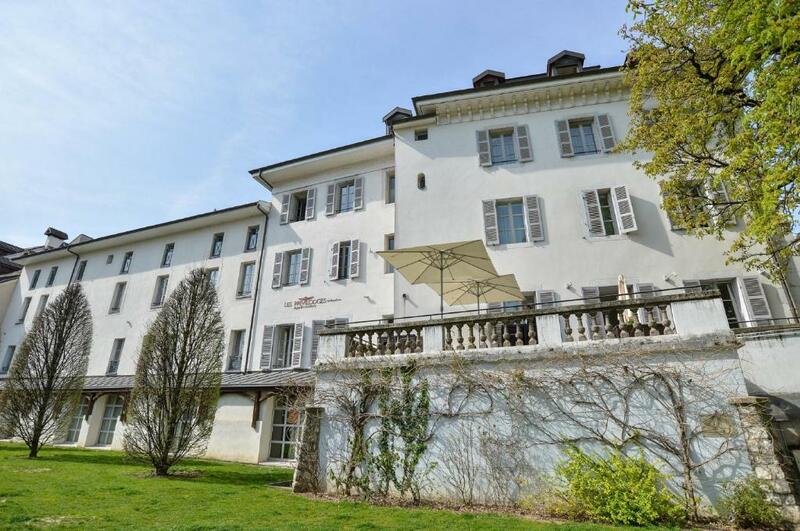 뀐 Located in the real heart of Annecy, this property has an excellent location score of 9.3! When would you like to stay at Privilodges Le Royal - Apparthotel? 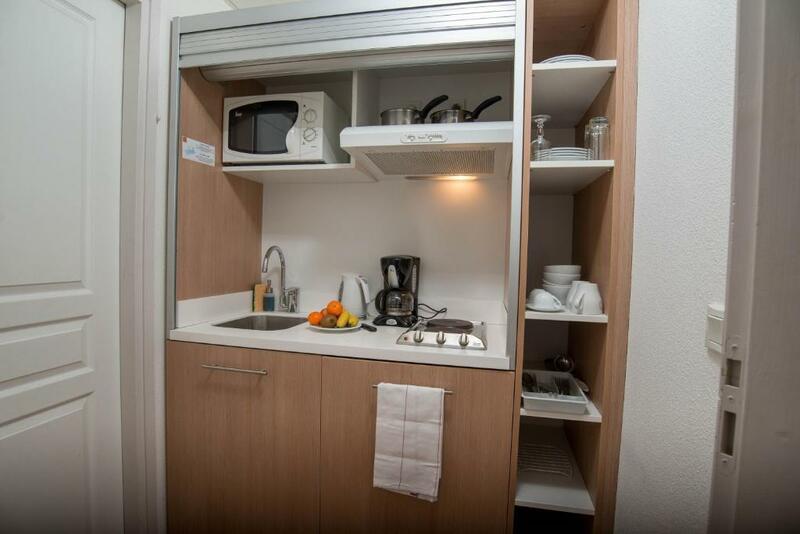 This air-conditioned studio has a pull-down double bed and a kitchenette equipped with a microwave and fridge. 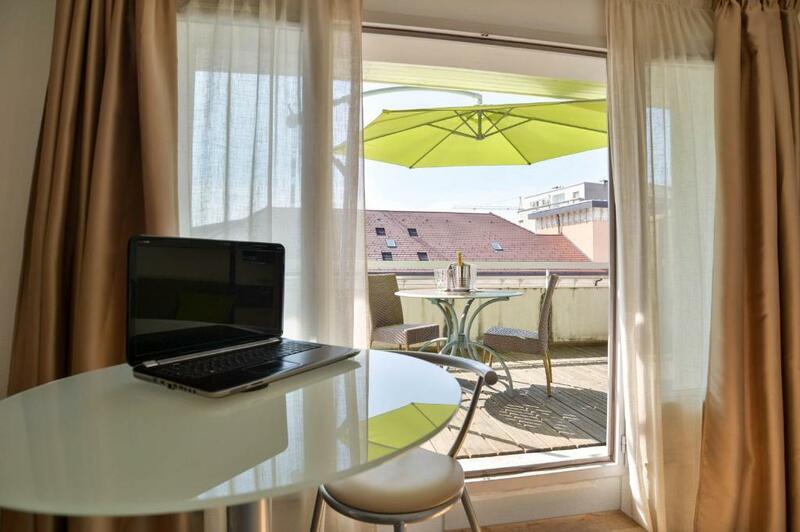 This spacious studio has a pull-down double bed and a kitchenette equipped with a microwave and fridge. This apartment has a separate bedroom, a sofa bed in the living room, a private bathroom and an equipped kitchenette. The bed in the bedroom can be separated into 2 separate beds, if requested at the time of booking. This air-conditioned studio is more spacious. It has a pull-down double bed and a kitchenette equipped with a microwave and fridge. La résidence hôtelière à Annecy Le Royal est située dans un hôtel où furent hébergés la Reine Victoria et Napoléon, datant du 19ème siècle. Le bâtiment a été transformé en Aparthôtel en 2006 et rénové en 2010. Vous vous trouvez au coeur de la ville d’’Annecy, en Haute Savoie, à 200 mètres du lac d’Annecy, à 400 mètres de la Gare d’’Annecy et aux abords de la vieille ville. Découvrez la ville à pied, ses monuments historiques comme la cathédrale de l’’Evêché située en face de la résidence et ses commerces de proximité. Annecy’s old town is full of arcades with hidden boutiques and restaurants. The Palais de l’Île sits peacefully on one of the many canals that wind through the old quarter. House Rules Privilodges Le Royal - Apparthotel takes special requests – add in the next step! A EUR200 damage deposit is required on arrival (around USD222.88). This deposit will be fully refunded at check-out, as long as there isn't any damage to the property. Privilodges Le Royal - Apparthotel accepts these cards and reserves the right to temporarily hold an amount prior to arrival. If accommodations is not cleaned before departure, cleaning is charged at EUR 30 per hour taken to clean if the rubbish is not taken out and the kitchen and the dishes are not clean. Baby cots are subject to availability and need to be confirmed by the property upon request. A limited number of private parking spaces are available for an extra charge, upon reservation. A damage deposit of EUR 200 is required on arrival. That's about 222.88USD. You should be reimbursed on check-out. Lovely clean apartment with small kitchen area and nice lounge area in a very central location near a nice park area and the old town.The bed was extra comfortable. The hotel is strategically located close to the tourist spots .The best I like it , the sttafs was smily friendly and helpful, I recommend this hotel. The location, the small kitchen, the coffee facilities and the terrace. The kitchen would have benefited from a good bread knife, it only had one small, dull, paring knife- we had a very difficult time slicing bread with it. Ok - bit strange not seeing anyone at breakfast, but it was fine. Great Location, clean, very friendly and accommodating staff! No parking available. However they give discount at a public parking nearby Charging extra 10 euros for the dog. This was not mentioned prior to booking. Beds were confertable. Reception was friendly and nice. I like firmer pillows - only a tiny criticism! Very spacious, comfortable bed, excellent price and very central. Lovely old building on a quiet courtyard. It’s great to be able to park just outside too! The shower lacks a curtain. The bathroom floor was always wet.